Frontline troops need food, fuel and ammunition to keep them alive but resupplying them can be extremely hazardous, which is why engineers are being tasked with finding ‘last mile’ delivery solutions. To this end, Horiba Mira has been awarded £700,000 to develop its own end-to-end logistics resupply vehicle. The contract is for the second phase of the Autonomous Last Mile Resupply (ALMRS) competition, a Defence and Security Accelerator (DASA) initiative seeking autonomous systems to deliver mission-critical supplies. Such vehicles could also change how humanitarian aid is delivered. Horiba Mira’s contribution to the competition is Viking, the company’s latest all-terrain, multirole UGV (unmanned ground vehicle). The company said the 6×6, two tonne robot is integrated with advanced AI-based autonomous systems, including GPS denied navigation, advanced terrain perception and object recognition. 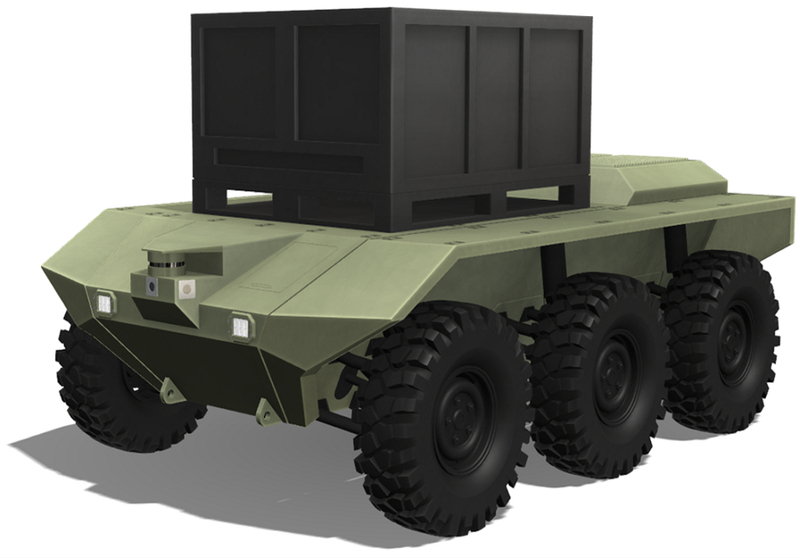 It can deliver up to 600kg of supplies over 200km and utilises a low-bandwidth communication system for command and control. Using a hand-held terminal, users in the field can make logistics resupply demands which are passed to the UGV. According to the company, Viking can use its advanced autonomy to adapt its own route on roads, tracks and across complex terrain to deliver supplies. The Viking prototype ALMRS system will be tested and demonstrated alongside Autonomous Warrior Land, a military exercise set to take place on Salisbury Plain in the autumn of 2018. All tests and evaluations on Viking will take place in relevant front-line scenarios. Once again, I do not wish to appear frivolous when discussing an important matter: but are we not being told by the Generals that there are no ‘front-lines’ in modern military incidents: and that we must prepare for what they have described as asymmetric combat. ie that the enemy are smart enough to out-think us? and have done so! There is not an enemy that is willing to sit still in front of either British or American troops. It is ill-advised. Every combat situation from here on will (in my humble opinion) be more of a hit-and-run situation, or urban combat, and I have my doubts about Viking surviving well enough (from RPG) to make it into the building or cluster where we may have troops surrounded, making a stand. There are answers to these asymmetric situations in urban combat, other than Viking, although this might be worth trying, especially if a cluster of Viking with autonomous weapons capability were able to decimate those surrounding a building or a cluster of buildings. I must agree with Mr. James a. Stewart & Mike Blamey. What defenses will these systems have to IED’S, enemy aircraft or armed enemy combatants bent on stealing provisions for their own use?? Granted in some cases when being used in concert with occupied supply trains these vehicles would be most useful but alone in the arena of combat we face today, I don’t think they would very useful or successful. Re the previous answers. I would rather a small autonomous vehicle were captured or blown up by “them” than a living breathing member of the Logistics core. I should imagine it would be possible to booby trap the vehicle so that if not accessed correctly it would either blow itself up (And presumably “them”) or otherwise render the contents unusable. Similarly I guess even an Autonomous Vehicle will have some sort of communication with the operator so I guess they could even activate such from base.